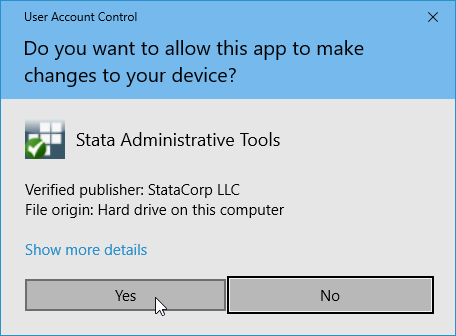 You may see another User Account Control dialog box asking whether Stata can make changes to your computer. This is normal for the first time you launch Stata. Get your License and Activation Key handy. You must enter something for all the fields in the Initialize License dialog before you can continue. The code and authorization are not case sensitive. If you make a mistake when typing the codes, you will be prompted to try again. Enter your name (at least five characters) and your organization (at least five characters). 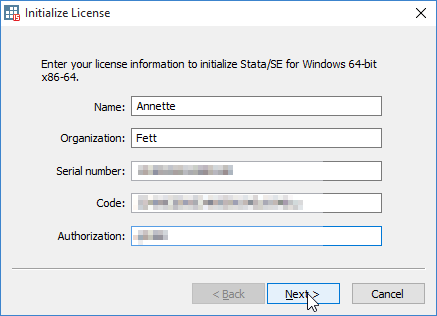 Then, enter the Serial Number, Code, and Authorization from the License and Activation Key you received from StataCorp. If you get the message “The serial number, code, and authorization are inconsistent”, try the initialization again. Copy and paste your code and authorization. Anything that looks like “o” (oh) is the letter “o”, anything like “0” is a zero, anything like “1” is the number one, and anything like “L” (el) is the letter “L”. Important: Do not lose your License and Activation Key. You may need it again in the future. Click on Next to submit your information. Next click on Finish to complete the installation and register your copy of Stata. 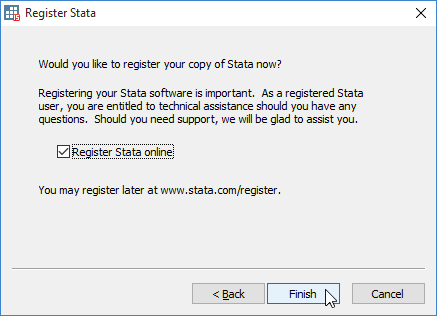 As a registered Stata user, you are entitled to free technical assistance should you have any questions. You can register at a later time if desired: stata.com/register. 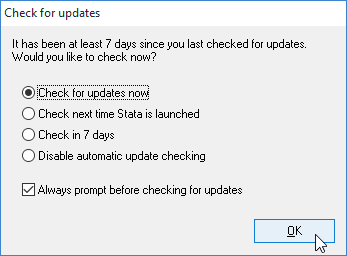 Stata will launch and ask whether you would like to check for updates. We recommend that you select Check for updates now to ensure that you have the latest version, and click on OK.
StataCorp releases updates to Stata often. These updates may include new features and bug fixes that can be automatically downloaded and installed by Stata from the Internet. There may be updates to Stata that are more recent than the version of Stata on your installation media. If an update is available, follow the instructions. By default, automatic update checking is enabled. This ensures that your Stata is up to date, it is convenient, and it causes no problems even if you are not connected to the Internet. Stata will never install an update without first asking you if it is ok to do so. It will merely notify you that one is available, and let you choose whether to install it. If you disable automatic update checking, it is a good idea to periodically check for updates to Stata. You have successfully installed Stata!